OpenAI, a research organization in artificial intelligence, can claim to be in the first place in the world: its AI system, trained to play the complex strategic game Dota 2, has surpassed the world champion team in eSports. Reported by The Verge. 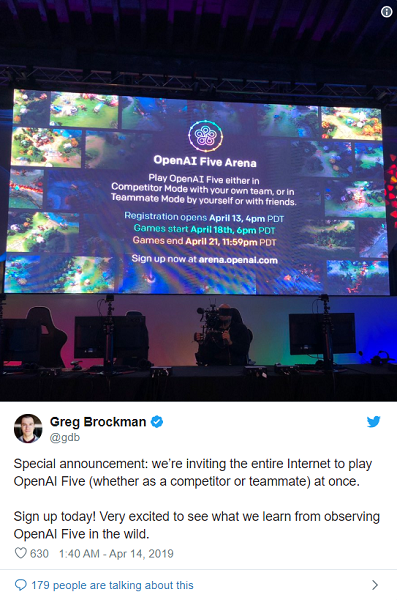 The OpenAI Five Finals competition was held April 13 in San Francisco. The top five Dota 2 professionals from the OG team, which won the eSports prize last year - $ 25 million, won first place in the international Dota 2 tournament. OG met in the "best of three" competition with five OpenAI bots. All of them were trained using the same deep learning methods with reinforcement and independently controlled by different levels of the same system. Reinforcement training is a method of trial and error for self-improvement, in which the AI enters the gaming environment with a zero understanding of how the game works and intensively trains using reward systems and other incentive mechanisms. "OpenAI Five is based on deep learning, which means that we programmed AI for learning and not for the game. In 10 months of existence, he has already played 45,000 years in Dota 2," said co-founder and chairman of OpenAI, Greg Brockman. In the first match of the day, OpenAI Five surprised OG with its victory, based on a number of aggressive tactics, including a kind of decision to spend the earned game currency to instantly revive the heroes after death, even at the beginning of the match. As noted by Greg Brockman, OpenAI loves strategies that contribute to short-term profit by identifying weaknesses in long-term planning. In this match, this tactic paid off and OpenAI Five got an advantage, which OG simply could not overcome, because the match was delayed to 30 minutes. For OpenAI, the victory here is evidence that the reinforced learning approach and the general philosophy about AI are successful. The research team will no longer hold public demonstrations of its AI-bot, now it is developing software that will allow people to collaborate with the OpenAI Five in real time, playing in a team with bots and learning from them unusual, unprecedented strategies and behaviors. The organization also introduced a platform for the game against OpenAI Five - Arena. OpenAI states that collaboration software may not be publicly available. But, according to Sam Altman, co-founder and CEO of OpenAI, this type of work suggests that working with AI agents can lead to huge benefits in the future. "This is an important lesson about how the world will work and teach such things. Cooperation is one of the most positive ideas about the future of the world - AI works together with people to make people better, to bring them more pleasure and influence," says Altman . OpenAI will continue to play Dota 2 and other games, primarily because they are good test sites for artificial intelligence and tools for performance testing. As Altman argues, there is probably no video game now that a system like the OpenAI Five would not have been able to master at a level that exceeds human capabilities. "OpenAI is trying to create a common artificial intelligence and share these benefits with the world, ensuring its security," commented Altman, referring to the desire to implement a multi-purpose AI system capable of performing any task that a person can perform.